I got done by this rogue builder.He said he noticed my gutters were full and he would do them for 40 quid.He said he would be back at 9am the next morning.11:30 he turned up and said he had done them at 6am and it is now 160 quid.One question my dog never barked at that time and I was having breakfast so is there the possibility he took money for something he never carried out?This took place on 1 November and I am still annoyed that I have been taken for a ride.HOW DARE THEY TAKE MONEY OFF DECENT HARD WORKING PEOPLE? My husband and I hired a roofer for my elderly Father who has taken £10,000 of my Dad's money and completed a tiny amount of work and had a couple of pallets of tiles delivered. We have not seen or heard from him for over a month. He has also moved house without telling us.Is there any way we can find out where he lives now so we can try and recover the money through the small claims court? Or, as my Father is elderly/vunerable, should the Police help us? A rogue roofer has fleeced my father in law out of 7500.00. It is part way through a job that is only worth £2000 unfortunately he did not tell his daughter until cash was paid. He was meant to turn up a couple of days ago when police would have been called while he and I were there. Police are now investigating. Please if you are asked to keep paying cash for work, do not and don’t feel embarrassed to seek help from the family or the police if it happens to you. Let’s get these guys off the streets. 40 New build houses. 8 month ago we moved in to our new build house, the last of 40 on our road. There has been a few unfinished jobs and mainly cosmetic problems with our house. After speaking with neighbours they too have the same problems and the builders are uncontactable. The main issue is that the road is incomplete along with large walls which would all cost a lot of money to complete. It does not look like the builders will be coming back to complete the job and this would mean the council will not take over maintenance of an incomplete private road. Please can you offer any advise on this. Many Thanks. Dear Tina, Dont know if you have read my recent post ? But as someone who learnt the hard way, having undergone the Small Claims Court process (successfully) I can advise you generally on best practise.... Email the Trademan with polite requests, you then have a record. Give them a reasonable time frame to respond. List what you are unhappy with. If they are "unreasonable" tell them you will get second opinions, and ask them to pay. You can employ the Services of professionals who will document the problems. At Small Claims Court, ask yourself what would a REASONABLE person think is fair and proportionate. A lot of tradesmen are greedy and lazy and play on the fact that most people do not want the hassle of going to Court. If they are accredited with a professional body, or advertise on trades sites, involve them, negative press will hit them where it hurts. 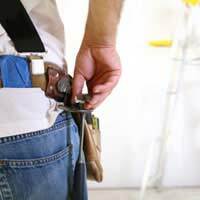 Decent tradespersons will want to complete the job to a satisfactory standard, after all most business is word of mouth, dodgy ones wont care less ! I had building work done about 3 months ago where the builders ripped out the kitchen, floor and bathroom. They seemed to have done a good job but just 3 days ago the electrics in the kitchen seem to stop working. I've taken all the plugs out of the sockets flicked the switch on again from the fuse box but still does not work. I called the builders and told what had happened he came to see what the problem was and said he'd call his electrician who is obviously not wanting to come. The builders are not taking any responsibility for the works they undertook and rectifying the problem. What can I do? Was the whole project arrranged by the builder or did you appoint the electrician separately? Earlier this year I successfully took a small builder in Farnborough, Hants, to Small Claims Court and won substantial compensation for his substandard workmanship. He had arrogantly denied any wrong doing, despite professional second opinions. He blamed me and would not admit ANY wrong doing. I paid for a Forensic Building consultant to examine his work, and draw up a report for Court, that even identified what Building Regs had been breached. Again the Builder said it was nonsense. We went to Court, he stalled, blamed me, but common sense won. I needed bailiffs to recover my money, he tried to tell them he owned nothing. Luckily they are used to people like him. I eventually got the full amount owed. Moral of the story: Check they are known to FMB ? Do they belong to Professional Trade Associations. Check companies house, are they a dissolved company. Do they advertise through professional sites, if not, why ?? Do they show and charge VAT. Are their business details correct and up to date. Finally, a gem: ALWAYS check the online CCJ register. For a few pounds you can check their history. It may just save you months of heartache and many thousands of pounds. After chasing a Cowboy builder unsuccessfully through the courts for six years. I changed tack and reported him to HMRC for tax evasion, he was fined £85,000. Ok I still haven't got my money ,but I feel great!!!. Courts are powerless and fraudsters know this. The more information you give HMRC the better. You may not find out any results(mine was given at a court hearing),but just think of the hassle he will get. Try it!!!! what have you got to lose. These fraudsters need stopping and the courts are useless. I had a builder in last November to lay a new paved driveway build a front garden wall and erect a fence. We have had a surveyor's report on the wall and it's built on insufficient foundations. Ultimately the wall will buckle and fail. The mortar is all different consistencies and you can scrape it out with your finger. The perps all different widths and the surface of the wall covered in mortar. The fence posts aren't verticle and the fence panels have had battens attached. The driveway is already sinking. I've contacted the builder and all he says is we were happy with it when it was done. He said he was going to get his own surveyor out but hasn't done. He knows full well he's done a botched job. I got him through an Internet site which says they vet and monitor all tradesmen, you know the one. He has no business address on his invoice, no invoice number only his business name. He won't provide his address to send legal documents to, got an address from the said internet site and sent a recorded letter to this, his mum's address, it was returned 2 weeks later stating no longer at this address. Contacted police who aren't interested and say it's a civil case. What can I do to get this address? Paid nearly £9000and we purchased the fencing ourselves. He doesn't reply to emails and is still continuing to trade. He is using uploads of other peoples work claiming them to be his and is still claiming to be a member of this internet site but isn't. He cancelled his membership as soon as our review went live. Any advice of where to go from here? Already contacted Trading Standards and Citizen's advice but we still are unable to get his address even though he still advertises from his mum's address andalso his partner's business address. I have A house that I let. I had it removated recently and unfortunately some of the work was unfinished. The people who rented the house were well aware of this. They agreed to ove into the house for a reduced fee while the builder finished them outstanding work. As a result of the tenant's controlling and aggressive behaviour the builder left. Prior to that, the tenant asked if we could stop all work as they wanted a rest from it. I agreed that the tenant's father could hang a couple of doors - that was all. Unbeknownst to me, the tenant's father took it upon himself to do a lot of other diy jobs , many of which were unnecessary and all substandard and anyway not to my taste or in keeping with the recently completely refurbishedproperty. He expected me to pay some £1700 (which a local builder quoted £500) and the tenant has refused to pay the rent for two months. I feel that they have obtained money by deception In other words, they have committed fraud. I would value your opinion. I had some work done on my house, some guttering put at the front and back of my house,the driveway power washed and had a quote for some painting to be done, I am not happy with the work that has been done, the guttering is cut short, the driveway looks a right mess, I have payed for the guttering and driveway but have said I won't pay for the painting they have started, I was told it would be sanded down and then painted they didn't even wipe it over just painted over dirty boards, the company had been badgering me for the money for the painting and have said they will call the police and make sure no other company will do any work on my property,I have written down all the quotes I was given and how much I have paid, I have told them I will not pay them anymore money but have started to be very nasty, what can I do? Hello,I wanted to ask advice as to what to do. I recently broke up with my boyfriend of 6 years and so found a handyman from recommendation. He had completed a couple of jobs before and I was happy. I had Airbnb guests staying and they damaged the sink so I asked Mark to come and fix it as soon as he could. I had just come back from my uncles funeral that day and was feeling emotional and I explained the situation to mark. He started quoting lots of numbers. Anyway, the situation got out of hand and he ended up charging £1018 for replacing a tap, fixing the piping and 'made good' the panelling underneath. He had already asked for half of the money to be transferred upfront. So I paid £450. I started to get suspicious and by chance I bumped into a guy who I've met years ago who repairs work in the block. I asked him to come and have a look and he said that job should have taken 2 hours and no more than £250. He also told me to get quotes from others and they all came in around £250 plus materials. So I've already overlaid for the job and he is demanding the rest. I refused until he showed me receipts and he started to get very aggressive and nasty. I even called the police and they are taking a statement. I guess the question is - what do I do? I'm feeling harassed and concerned about my safety and don't want to be bullied into paying the rest which is clearly a sham. I'm a single women and feel very vulnerable and I'm worried he will throw a brick through my window or something. Any help will be much appreciated, thank you. Always get a written quote before hand - that way you can establish whether costs are realistic. Never pay anything up front. Hello, I wanted to ask advice as to what to do. I recently broke up with my boyfriend of 6 years and so found a handyman from recommendation. He had completed a couple of jobs before and I was happy. I had Airbnb guests staying and they damaged the sink so I asked Mark to come and fix it as soon as he could. I had just come back from my uncles funeral that day and was feeling emotional and I explained the situation to mark. He started quoting lots of numbers. Anyway, the situation got out of hand and he ended up charging £1018 for replacing a tap, fixing the piping and 'made good' the panelling underneath. He had already asked for half of the money to be transferred upfront. So I paid £450. I started to get suspicious and by chance I bumped into a guy who I've met years ago who repairs work in the block. I asked him to come and have a look and he said that job should have taken 2 hours and no more than £250. He also told me to get quotes from others and they all came in around £250 plus materials. So I've already overlaid for the job and he is demanding the rest. I refused until he showed me receipts and he started to get very aggressive and nasty. I even called the police and they are taking a statement. I guess the question is - what do I do? I'm feeling harassed and concerned about my safety and don't want to be bullied into paying the rest which is clearly a sham. I'm a single women and feel very vulnerable and I'm worried he will throw a brick through my window or something. Any help will be much appreciated, thank you. Had a builder in to renovate a garage and two small brick sheds. He put in three second hand windows and three second hand doors. Plus Cladded the garage roof. He never gave a quote despite being constantly asked. ‘Don’t worry it won’t come to much’ he kept putting off. I had a roundabout figure of £2.500 in mind. He had just given me a bill of £7.900. What recourse do I have in the way of an independent arbritation. This is a civil matter for the courts now really. Sorry we can't be of any more help. I omitted to say on my previous comments. The builder is telling people that he is in business with my husband. I told the builder to stop lies.My husband has never been in business with himMy husband has been in business on his own for almost 60 years on his own so why should he decide to go into business with him.I've told the builder we don't want unhappy clients of his knocking on our door. The Independant Survey said when he was leaving me at the house/s when he shook my hand was 'I do not know how much it is going to cost to put it right but I can tell you it is all going to have to be done again' He has also signed a Statement of Truth on his report. . I have massive evidence against this delusional , in denial . a layer builder and Ineed presentation in court. We are having an extension built, our builder gave us a fixed price quote of £35k based on an estimated programme of 8 weeks. The project began reasonably well, although from the outset it was running behind schedule (There has never been a published programme or plan, however when we asked the builder at the beginning of the week what was planned for the week, he would tell us the planned work which by the end of the week was rarely all completed). We went on holiday for two weeks and when we returned found that the builder had knocked through into our existing kitchen, despite the fact that the new build wasn't weatherproof - i.e. no roof and no windows and doors.The exterior brickwork is completely unacceptable on one wall, as the wall is wavy and does not align with the existing housebrickwork. At about the 5ft level the brickwork goes from being aligned with the house brickwork to being half a brick out within four courses. We notified our builder that this is not acceptable and he re-worked this wall. to exactly the same unacceptable standard.We have now commenced week 17 and we are still missing a window and the bi-fold doors. We have repeatidly chased the builder in all aspects of the outstanding work (internally - fitting of windows and doors, 2nd fix plumbing and electrics, levelling of the floor, window sills and coving) and have also highlighted that in addition to the brickwork that needs rectifying, the other walls need re-pointing, the drain cover needs making level with the existing ground in addition to the finishing off of the groundwork.Our concern is that the builder has told us he is skint (which may be why he hasn't yet collected the window and doors) or paid for the other trades required, yet we are desperate to complete as we have a new kitchen in storage ready to be fitted.We do not want to pay any additional money as we have already outlayed £33k on the understanding that the windows and doors would have been fitted. The builder is now not answering any of our calls but sent a text at 02:00am stating that he is now working on another project.Where do we go with this? Sorry there's not much you can do here apart from taking the builder to court to recover some of the money and the cost of paying a decent builder to rectify the damage. It's not much help to you at this stage... but lessons to learn are, to ask for a staged work and payment plan upfront (and only hand over the money if you're absolutely satisfied) and to make sure you see examples of other jobs the builder has completed before commissioning them. We are having an extension built, our builder gave us a fixed price quote of £35k based on an estimated programme of 8 weeks. The project began reasonably well, although from the outset it was running behind schedule (There has never been a published programme or plan, however when we asked the builder at the beginning of the week what was planned for the week, he would tell us the planned work which by the end of the week was rarely all completed). We went on holiday for two weeks and when we returned found that the builder had knocked through into our existing kitchen, despite the fact that the new build wasn't weatherproof - i.e. no roof and no windows and doors. The exterior brickwork is completely unacceptable on one wall, as the wall is wavy and does not align with the existing housebrickwork. At about the 5ft level the brickwork goes from being aligned with the house brickwork to being half a brick out within four courses. We notified our builder that this is not acceptable and he re-worked this wall.... to exactly the same unacceptable standard. We have now commenced week 17 and we are still missing a window and the bi-fold doors. We have repeatidly chased the builder in all aspects of the outstanding work (internally - fitting of windows and doors, 2nd fix plumbing and electrics, levelling of the floor, window sills and coving) and have also highlighted that in addition to the brickwork that needs rectifying, the other walls need re-pointing, the drain cover needs making level with the existing ground in addition to the finishing off of the groundwork. Our concern is that the builder has told us he is skint (which may be why he hasn't yet collected the window and doors) or paid for the other trades required, yet we are desperate to complete as we have a new kitchen in storage ready to be fitted. We do not want to pay any additional money as we have already outlayed £33k on the understanding that the windows and doors would have been fitted. The builder is now not answering any of our calls but sent a text at 02:00am stating that he is now working on another project. Where do we go with this?